Slice the tofu into ½ inch slices and press the excess water out of the tofu by placing the slices between two towels and covering with a flat, heavy object. Let the tofu press for about 20 minutes. Mix the tofu marinade in a Tupperware, slice your tofu squares into thirds and add the tofu to the marinade. Shake lightly to evenly cover the tofu and let the tofu marinade in the fridge for a minimum of 20 minutes. Add the ingredients for the coconut rice to a medium pot and bring to a boil. Reduce the heat and simmer the rice for 30 minutes, until the liquid is absorbed. Place the marinated tofu on a greased baking sheet. Bake for 30 minutes flipping halfway through. While your tofu cooks and rice simmers prep your veggies. Slice the Mango, green pepper, green onion, avocado, cucumber, jalapeno, and any other veggies you may want into thin strips so that they wrap easiest. Put the rice in a large bowl and allow it to cool. Organize your work station so everything is easy to reach. Lay the nori sheet, shiny side down on the rolling mat. Cover with the coconut rice leaving ½ inch uncovered at the far end. Lay the fillings in a line across the rice. 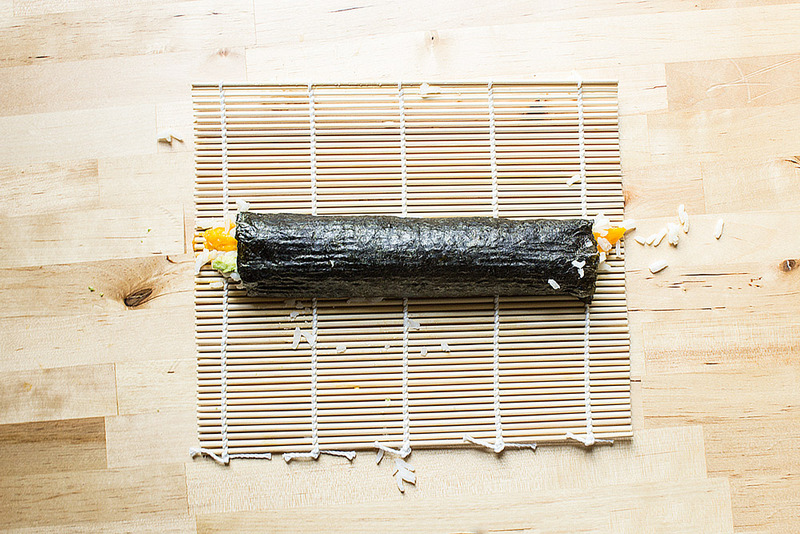 Use the mat to roll the rice, squeezing tightly to create a tight, solid roll. Slice the roll into 6-7 equal pieces. 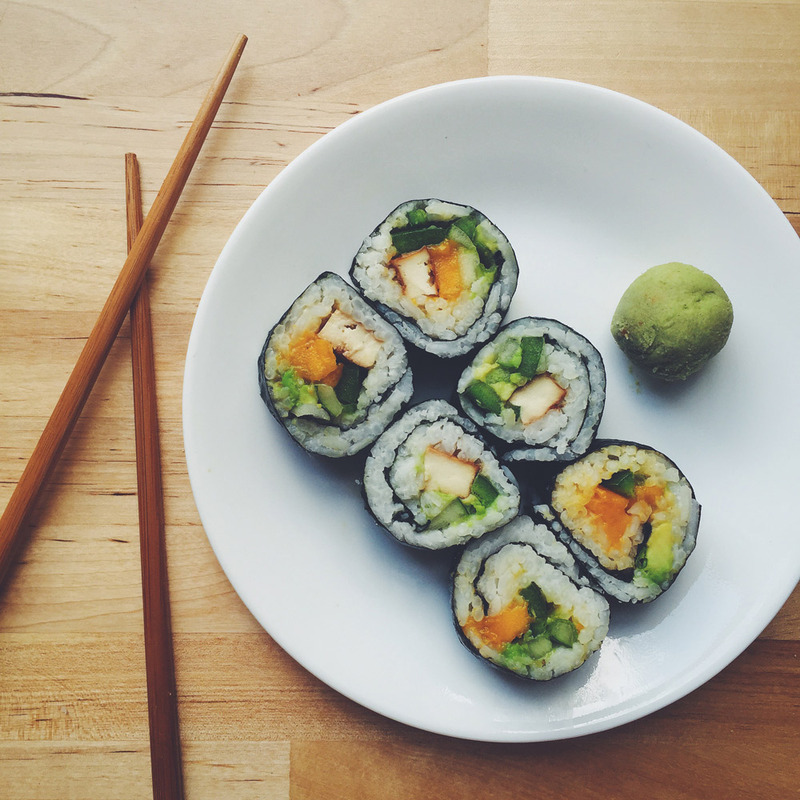 Serve with wasabi, soy sauce and pickled ginger, or your favorite additions. From the top: All ingredients, Middle: All ingredients except mango, Last: All ingredients except tofu. Our personal favorite roll, was all the ingredients together!